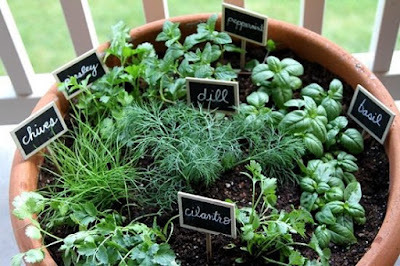 Container herb gardening is a great way to get started growing your own herbs. The good news is that it is easy, and great fun! The portability of growing herbs in containers is great because you can put them anywhere you live, whether you have a big yard or live in an apartment with a small balcony. First, find a container with good drainage. Even something like a recycled market basket can be used for growing herbs. Whatever container you use, make sure that it is food safe, as some pots are made with lead or other materials that you don't want in your food. Always use the largest possible container for your available space. Larger containers equal less maintenance than smaller ones in terms of drying out and needing water more frequently. Be aware that terra cotta pots are porous and will require more frequent watering as well. In general, herbs are tough and drought resistant plants, so growing them in containers is a good way to go. When you're ready to add soil, use a ready-grow soil mix with all the ingredients for optimal growth already mixed in. Mix a little "Soil Moist" (or something similar) with polymers into the soil so that the soil will hold more moisture. This way, you won't have to water every day. You can easily grow grassier herbs like Chives, Cilantro, Parsley, and Mint from seed. Experts recommend buying larger, woody herbs such as Rosemary, Thyme, Oregano, and Marjoram from a local nursery and planting them into your containers. I also like to buy Basil and Sage as plants, not seeds. When you remove the plant from the little container that you bought it in, it will usually be root-bound, so tease the roots apart a little to help optimize growth. Plant herbs that grow taller in the rear of the container, plant shorter herbs in the front, so that all plants get plenty of light. Cascading plants such as Oregano and Thyme should be planted near the edges of the container so they can spill over the sides. Some tall herbs include: Basil, Dill, and Rosemary. Medium size includes: Chives, Oregano, Parsley, and Sage. Short: Thyme. You can fit quite a few plants into a single container, but you will have to harvest more often so that they don't get overcrowded. Next, water the plants in. Be sure to water when your thumb stays dry halfway up when inserted into the soil. Keep your container herb garden right outside your kitchen door so that it is easy for you to reach your fresh herbs whenever you need them. Depending on your climate, you may have to re-plant some of your herbs each spring, or they may survive the winter. Or, if you allow the herb to flower and seed, you may find the plants coming back on their own. If you want to preserve some of your herbs at the end of the season, simply cut long stems, hang to dry (for a couple weeks), then harvest and store in an airtight container.